Exergen’s Microscanner D-Series are designed as highly accurate and reliable temperature references as well as fast easy-to-use infrared scanners. Since all components making up a D-Series are drift-free there is never a requirement to calibrate the instrument once it leaves the factory, and no calibration means is provided on the instrument (except certain high temperature models). Accordingly, if the DSeries calibration has shifted from its factory setting, it requires repair since a component has failed. Similarly, non-adjustable IRt/c models are factory calibrated for life, and if they do not reproduce their calibration, they should be considered failed. Unless you have technical experience with and have a laboratory infrared “blackbody,” this calibration checking technique is recommended by the factory. 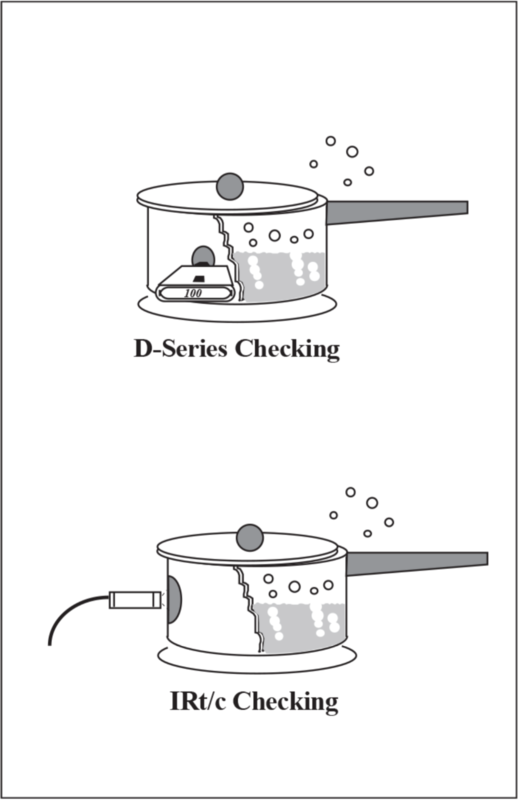 Boiling water is a physical constant, easily used, and requires no technical set-up of elaborate equipment or checking of traceable standards. The open boiling point of (reasonably pure) water is affected by only one factor: barometric pressure. 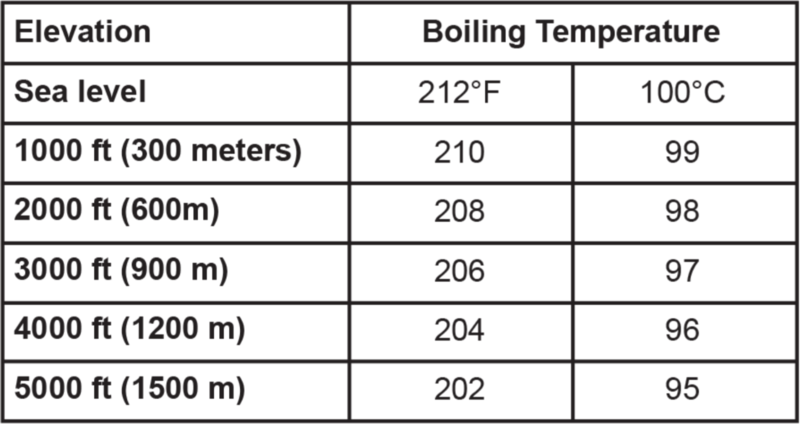 The standard 212°F (100°C) boiling point is for a barometric pressure of 30.00 inches of Hg (mercury), or in metric terms, 1 Bar (1000 millibars). This is “normal” at sea level. Barometric pressure can be affected by elevation above sea level, and by weather conditions. Elevation Correction: The boiling point of water is lowered by approximately 2°F (1°C) for every 1000 ft (300 m) above sea level with no unusual weather conditions. If your weather is “normal” and you are not using the barometric pressure method, you can simply use the following corrections. - Add to the boiling temperature for higher than normal pressure. - Subtract for lower than normal pressures. Note: Always clean the sensor lens prior to calibration testing. A cotton swab with a mild cleaner such as alcohol works well. - Metal pot with cover, minimum 4” (10 cm) tall. - Solid paint marker or thin opaque tape. 1. Use a metal pot, with cover, for boiling water. 2. Fill the pot at least 1/2 fill with water. 3. Use the solid paint marker supplied with your DSeries, or a piece of opaque (non-see through) tape, or a thin electrical tape, to put a measuring spot at least 1in. (25 mm) in diameter on the outside surface of the pot. Make sure the measuring spot is at, or slightly below, the water level. 5. Briefly touch the nosepiece flat onto the black mark and note the temperature reading. For an IRt/c, bring the sensor as close as possible without touching. The reading should be within ±2% of the actual boiling point (for example ±2°C for 100°C boiling point). If the reading is not within these limits, the instrument has a failed component and should be returned to Exergen for repair. Please call for an RMA number prior to shipment. For the IRt/c refer to Tech Note #73 for specifications.